Support Small Business Saturday in Manchester, Connecticut. 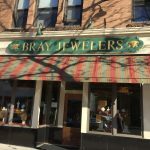 Pick up some jewelry at Bray Jewelers, some flowers at Browns Flowers and finish your day with a meal and a beverage at The Main Pub! !